At L & S Service, we strive to do the very best clutch replacement possible. We use genuine Luk® clutch assemblies. Luk® is one of the largest suppliers, world wide, to the original equipment manufacturers. These clutch assemblies include the clutch cover (pressure plate), disc, release bearing, and (if applicable) crankshaft pilot bearing. 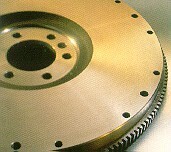 We feel that Luk® clutches are the very best clutch components available. We also have a VanNorman® flywheel resurfacing grinder. We feel this does the quickest and best job possible, insuring that the flywheel is brought back to factory specifications. We do not normally have to depend on aftermarket flywheel shims to correct for large removal of flywheel material when using this fine piece of equipment.